Xóchitl Montoya, a current student in the Post Graduate Culinary Management Program, came to study at Selkirk College from Mexico City. After travelling to Canada and visiting Nelson, she promised herself that she would one day live in the small town that was rich in culture and art. Xóchitl was excited about the Post Graduate Culinary Management program as it contained three key components that she valued - practical training, management classes and a work term experience. She says that these components gave her a wider view of the industry as well as more options for her professional future. Xóchitl expressed that Selkirk College offers what students need in terms of facilities, equipment and small classrooms, which allow instructors to help students’ individual situations and needs and allowing them to succeed. “Studying at Selkirk College is not everything,” she explains. 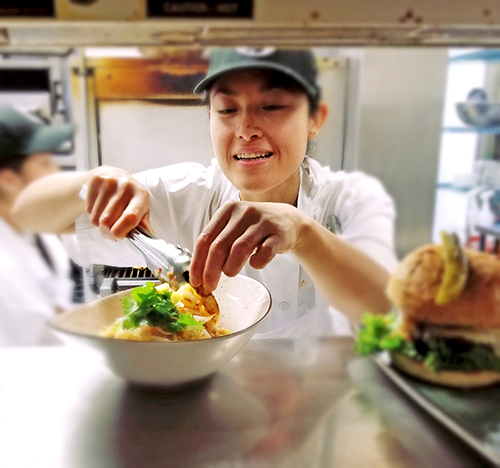 Xóchitl plans to graduate and move to a bigger city where she can get a job in a large company where she can further explore her culinary skills and build a successful career in her industry. Xóchitl received the International Entrance Scholarship. Learn more about Post-Graduate Culinary Management.